Basic life support (BLS) is the medical care given to those with life-threatening injuries until the victim arrives at a hospital where full medical care can be provided. Cardiac arrest or inability to breath are the two primary life-threatening circumstances that prompt a need for basic life support. Due to its comprehensive nature, BLS for healthcare providers is one of the most popular CPR Consultants/Response Institute courses. Students of this course receive a two-year certification for AHA BLS HCP. While not all healthcare professionals deal with people likely to be in life-threatening situations, you never know when this knowledge will come in handy, regardless of your profession. Aside from actual certification requirements, it’s important for healthcare professionals to keep their knowledge sharp. Participants should expect to walk away with the ability to recognize several life-threatening emergencies, provide CPR, use an AED, and relieve choking in a safe, timely and effective manner. Being able to recognize that something is wrong is the first step to saving a life. If your job doesn’t put you in critical life-saving circumstances regularly, it’s important to practice these skills in a hands-on environment. Reacting under pressure takes practice and repetition. Take this quiz to find out if you can recognize a heart attack. Doctors, heath professionals, and the American Heart Association continue to test subtle changes to CPR techniques. Over time, better or more effective methods are found. It’s vital that all healthcare professionals keep up-to-date with current best practices. The AHA released new CPR guidelines in 2015. Encouraging people to stay current with recommended practices is one of the primary reasons certifications expire after two years. Did you know the most common foods to cause choking are hot dogs, hard candy, chewing gum, nuts, seeds, meats, cheeses, grapes, popcorn, peanut butter, raw vegetables, and raisons? Small objects can pose a problem as well, especially to small children. Coins are involved in 18% of all choking-related emergency department visits for children ages 1 to 4 years. 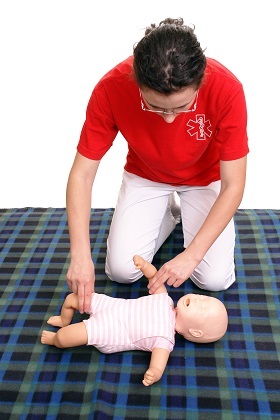 Keeping these skills sharp and knowing how to relieve a child vs. an infant vs. an adult is a very important of any healthcare providers training. Participating in the BLS for Healthcare Providers course at CPR Consultants and the Response Institute will help you stay current with best practices and sharpen your hands-on skills, not to mention provide you with necessary certifications. Learn from the best. We were named one of the top 1% of training centers through the American Heart Association. Contact one of our emergency training experts if you’d like to learn more about this class or one of the many other courses offered.